There was a recent article in the fantastic AHA Parenting blog about unconditional love that caught my eye, mainly because I was thinking about this the day before. I grew up in generation where our parents had massive expectations of us and seemed perpetually disappointed no matter what we did. The old stereotype of getting straight A’s and being asked why we didn't get all A+’s like the neighbours kids, always being compared, always room for improvement whether our grades, our looks, our relationship choices, our careers. I remember getting annoyed as a teenager and thinking how unfair it was I got compared to my mum’s friend’s daughter who passed her driving test and not the one who hung around in the street in the evening, dressed in tight clothes or the one that failed every subject at school. It didn't help that all of my mum’s friends compared their daughters to me, which made them dislike me a little (I can’t help it I just am a good girl! Or maybe just a bit of a people pleaser). In any case, none of us just ever seemed to be good enough. Fast forward to today and as a parent I have found myself with the blessing of having a different perspective on the things my parents did. As I mum, there are some things that I look back on and think I would never do (like the time my brother wouldn't eat his lunch and got his keema curry dumped on his head). There are things I look at and think “did they really do that just for us?” like when my mum worked as a seamstress for 12 hours a day on very small wages to give us the things we wanted. Then there are things that I am starting to think might have been a good idea after all, like the time my parents told us they were going to a funeral, left us with my uncle and went to Madame Tussaud’s instead, telling us about it with great glee when they got back. My perspective as a mum does make me think about why they always held such high standards and why we could never meet them. They invested everything in us, not just money, but emotionally and socially. As the first generation of immigrants, they had to give up their dreams and survive. I know my dad is very bright; he came here after he did his matriculation (equivalent to GCSE’s in Pakistan) and didn’t even wait to get his results, although he also sat a friends exam and he passed with high marks. He started working multiple jobs when he was 16 and tried to study but found it too much and gave up. My mum lost her mum at a young age and never went to school, she wanted her children to be educated and not suffer what she had to go through. Our doing well would act as a validation of their guidance and parenting. How we turned out was a sign of their success or failure. It made me think about whether I ever put my children in the same position. I don’t believe in comparing my children to others. I think we are each born with our own strengths and circumstances and Allah (SWT) determines a different path for each of us, so there is no sense in comparing. I also don’t like to compare my children to myself as a child. As someone said to me once, Allah (SWT) made us for our time, He has made these children for this time – a harsher, scarier time it seems with so much more to deal with. I considered whether I would love my children conditionally always regardless of what they did. It’s easy to say yes, but I see people of my parent’s generation who turned their back on their children when they were not obedient or didn’t agree with their life choices. I have seen many mothers withhold their approval and use the silent treatment or emotional blackmail, for instance when trying to get their children to marry someone they have chosen for instance. I like to think I would never do that. But what if they did something really bad, what if they hurt me, would I stop loving them? What if they made life choices that were painful to me? A hard question, but I realised that even if I was angry and hurt, I couldn’t stop loving them. I like to think that rather than turn my back on them I would be clear about how I feel but continue to deal with them like an adult. 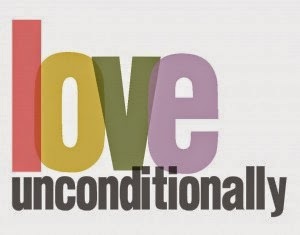 “All parents know that children need unconditional love to thrive. But how can we give our children something many of us haven't really experienced? The answer is even more curious: unconditional love for ourselves? Considering the way we were raised with the high expectations that we could never meet, the cultural and societal definitions of success which didn't always match with the things that we really dreamed of doing, to love ourselves unconditionally seems almost impossible. Certainly it is something I have struggled with for a long time. Perhaps because we have the faulty thinking that love and respect are a result of what we do rather than who we are. This means we think we have to earn that love rather than deserve it as we are. I believe that each of us is born with purpose and that makes us important d worthy of love. That’s easy to believe about others but sometimes very hard to believe about ourselves. I'm not a parent, but I believe that blog is how every child deserved to be raised. I'm so glad you're considering what is being said on there. I love the idea of your parents going to Madame Tussaud's!! :) I've often thought about the unconditional love part of it too. If such a thing does exist, it's only possible from a mother to her child, but even then I think our basic human nature makes us expect something back. A complicated subject, and you've written well about it!